AUD 13,378 Excl. Duties / Taxes. 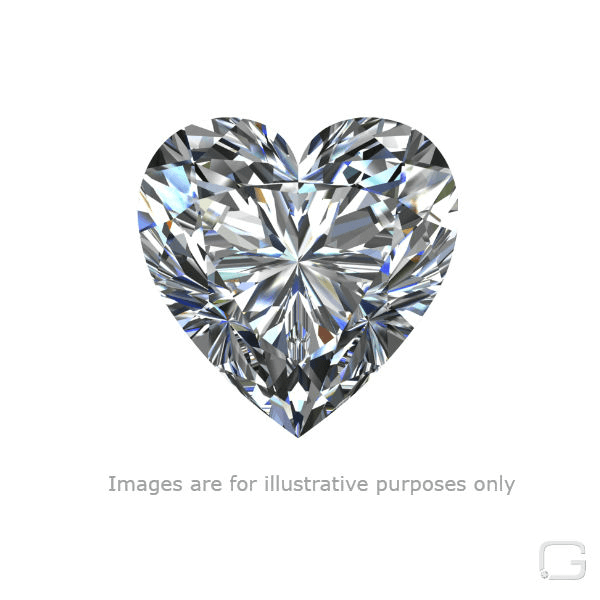 This Heart diamond is 1.51 carat in weight, and comes with Excellent polish and Excellent symmetry, as verified from an independent gemological laboratory. The diamond is graded G in colour, and has a clarity grade of VS1. The diamond's HRD grading report number is 190000029659, which will detail further its specifications and measurements, and will also come with the purchase of the stone. AUD 16,214 Excl. Duties / Taxes. This Heart diamond is 1.71 carat in weight, and comes with Excellent polish and Excellent symmetry, as verified from an independent gemological laboratory. The diamond is graded G in colour, and has a clarity grade of VS1. The diamond's HRD grading report number is 190000026913, which will detail further its specifications and measurements, and will also come with the purchase of the stone. AUD 9,112 Excl. Duties / Taxes. This Heart diamond is 1.5 carat in weight, and comes with Very Good polish and Very Good symmetry, as verified from an independent gemological laboratory. The diamond is graded F in colour, and has a clarity grade of SI2. The diamond's HRD grading report number is 180000008652, which will detail further its specifications and measurements, and will also come with the purchase of the stone. AUD 15,649 Excl. Duties / Taxes. This Heart diamond is 2.03 carat in weight, and comes with Excellent polish and Very Good symmetry, as verified from an independent gemological laboratory. The diamond is graded F in colour, and has a clarity grade of SI2. The diamond's HRD grading report number is 180000162684, which will detail further its specifications and measurements, and will also come with the purchase of the stone. AUD 29,644 Excl. Duties / Taxes. This Heart diamond is 3.02 carat in weight, and comes with Excellent polish and Excellent symmetry, as verified from an independent gemological laboratory. The diamond is graded J in colour, and has a clarity grade of VS1. The diamond's HRD grading report number is 180000101339, which will detail further its specifications and measurements, and will also come with the purchase of the stone. AUD 8,971 Excl. Duties / Taxes. This Heart diamond is 1.01 carat in weight, and comes with Very Good polish and Very Good symmetry, as verified from an independent gemological laboratory. The diamond is graded D in colour, and has a clarity grade of SI2. The diamond's HRD grading report number is 16011724001, which will detail further its specifications and measurements, and will also come with the purchase of the stone. AUD 4,897 Excl. Duties / Taxes. This Heart diamond is 1.06 carat in weight, and comes with Very Good polish and Good symmetry, as verified from an independent gemological laboratory. The diamond is graded H in colour, and has a clarity grade of SI2. The diamond's HRD grading report number is 11019200004, which will detail further its specifications and measurements, and will also come with the purchase of the stone. AUD 8,646 Excl. Duties / Taxes. This Heart diamond is 1.5 carat in weight, and comes with Excellent polish and Very Good symmetry, as verified from an independent gemological laboratory. The diamond is graded I in colour, and has a clarity grade of SI1. The diamond's HRD grading report number is 180000155728, which will detail further its specifications and measurements, and will also come with the purchase of the stone. This Heart diamond is 1.01 carat in weight, and comes with Excellent polish and Very Good symmetry, as verified from an independent gemological laboratory. The diamond is graded F in colour, and has a clarity grade of SI2. The diamond's HRD grading report number is 180000023749, which will detail further its specifications and measurements, and will also come with the purchase of the stone. This Heart diamond is 1 carat in weight, and comes with Excellent polish and Very Good symmetry, as verified from an independent gemological laboratory. The diamond is graded G in colour, and has a clarity grade of SI1. The diamond's HRD grading report number is 180000117146, which will detail further its specifications and measurements, and will also come with the purchase of the stone. AUD 3,942 Excl. Duties / Taxes. This Heart diamond is 1.02 carat in weight, and comes with Excellent polish and Very Good symmetry, as verified from an independent gemological laboratory. The diamond is graded G in colour, and has a clarity grade of SI2. The diamond's HRD grading report number is 180000064081, which will detail further its specifications and measurements, and will also come with the purchase of the stone. AUD 44,657 Excl. Duties / Taxes. This Heart diamond is 3.01 carat in weight, and comes with Excellent polish and Very Good symmetry, as verified from an independent gemological laboratory. The diamond is graded I in colour, and has a clarity grade of VVS1. The diamond's HRD grading report number is 180000164443, which will detail further its specifications and measurements, and will also come with the purchase of the stone. AUD 83,171 Excl. Duties / Taxes. This Heart diamond is 5.02 carat in weight, and comes with Excellent polish and Very Good symmetry, as verified from an independent gemological laboratory. The diamond is graded H in colour, and has a clarity grade of SI2. The diamond's HRD grading report number is 180000155722, which will detail further its specifications and measurements, and will also come with the purchase of the stone. AUD 72,553 Excl. Duties / Taxes. This Heart diamond is 5.59 carat in weight, and comes with Excellent polish and Excellent symmetry, as verified from an independent gemological laboratory. The diamond is graded K in colour, and has a clarity grade of VS2. The diamond's HRD grading report number is 180000155726, which will detail further its specifications and measurements, and will also come with the purchase of the stone. AUD 3,758 Excl. Duties / Taxes. This Heart diamond is 1.01 carat in weight, and comes with Very Good polish and Excellent symmetry, as verified from an independent gemological laboratory. The diamond is graded G in colour, and has a clarity grade of SI2. The diamond's HRD grading report number is 18029641001, which will detail further its specifications and measurements, and will also come with the purchase of the stone. AUD 5,162 Excl. Duties / Taxes. This Heart diamond is 1.01 carat in weight, and comes with Excellent polish and Excellent symmetry, as verified from an independent gemological laboratory. The diamond is graded G in colour, and has a clarity grade of SI1. The diamond's HRD grading report number is 190000038618, which will detail further its specifications and measurements, and will also come with the purchase of the stone. AUD 5,512 Excl. Duties / Taxes. This Heart diamond is 1.01 carat in weight, and comes with Excellent polish and Very Good symmetry, as verified from an independent gemological laboratory. The diamond is graded G in colour, and has a clarity grade of SI1. The diamond's HRD grading report number is 190000038928, which will detail further its specifications and measurements, and will also come with the purchase of the stone. This Heart diamond is 3.01 carat in weight, and comes with Excellent polish and Very Good symmetry, as verified from an independent gemological laboratory. The diamond is graded G in colour, and has a clarity grade of VS1. The diamond's HRD grading report number is 190000036240, which will detail further its specifications and measurements, and will also come with the purchase of the stone. AUD 48,733 Excl. Duties / Taxes. This Heart diamond is 5.02 carat in weight, and comes with Excellent polish and Good symmetry, as verified from an independent gemological laboratory. The diamond is graded G in colour, and has a clarity grade of SI2. The diamond's HRD grading report number is 180000153712, which will detail further its specifications and measurements, and will also come with the purchase of the stone. AUD 7,250 Excl. Duties / Taxes. This Heart diamond is 1.51 carat in weight, and comes with Excellent polish and Excellent symmetry, as verified from an independent gemological laboratory. The diamond is graded K in colour, and has a clarity grade of VS2. The diamond's HRD grading report number is 180000180418, which will detail further its specifications and measurements, and will also come with the purchase of the stone. This Heart diamond is 1.01 carat in weight, and comes with Excellent polish and Very Good symmetry, as verified from an independent gemological laboratory. The diamond is graded H in colour, and has a clarity grade of SI1. The diamond's HRD grading report number is 190000002598, which will detail further its specifications and measurements, and will also come with the purchase of the stone. AUD 5,665 Excl. Duties / Taxes. This Heart diamond is 1.01 carat in weight, and comes with Excellent polish and Very Good symmetry, as verified from an independent gemological laboratory. The diamond is graded H in colour, and has a clarity grade of VS2. The diamond's HRD grading report number is 180000181924 L, which will detail further its specifications and measurements, and will also come with the purchase of the stone. This Heart diamond is 1.01 carat in weight, and comes with Excellent polish and Very Good symmetry, as verified from an independent gemological laboratory. The diamond is graded G in colour, and has a clarity grade of SI1. The diamond's HRD grading report number is 190000038112, which will detail further its specifications and measurements, and will also come with the purchase of the stone. AUD 5,734 Excl. Duties / Taxes. This Heart diamond is 1.02 carat in weight, and comes with Very Good polish and Good symmetry, as verified from an independent gemological laboratory. The diamond is graded H in colour, and has a clarity grade of VS1. The diamond's HRD grading report number is 180000180403 L, which will detail further its specifications and measurements, and will also come with the purchase of the stone. This Heart diamond is 1.01 carat in weight, and comes with Excellent polish and Very Good symmetry, as verified from an independent gemological laboratory. The diamond is graded G in colour, and has a clarity grade of VS2. The diamond's HRD grading report number is 190000035009, which will detail further its specifications and measurements, and will also come with the purchase of the stone. This Heart diamond is 1.02 carat in weight, and comes with Excellent polish and Excellent symmetry, as verified from an independent gemological laboratory. The diamond is graded G in colour, and has a clarity grade of SI1. The diamond's HRD grading report number is 190000043979, which will detail further its specifications and measurements, and will also come with the purchase of the stone. This Heart diamond is 1.01 carat in weight, and comes with Excellent polish and Excellent symmetry, as verified from an independent gemological laboratory. The diamond is graded H in colour, and has a clarity grade of SI1. The diamond's HRD grading report number is 190000007686, which will detail further its specifications and measurements, and will also come with the purchase of the stone.